This weekend is usually associated with the largest amount of traffic heading to the Medicine Hat Stampede & Exhibition, even if it has been “officially” opened for two days now. I am grateful, for one, that most of the events are mirrored from Wednesday/Thursdays to Friday/Saturday for us that have to work. Even so, no matter when you head out, or if you already have, the exhibition to most is about the rides, the games, food, live performances, shopping, animals and most importantly, the fun – which you can experience any time during the annual 4 day extravaganza. Also, I love the coin pusher games. So satisfying. 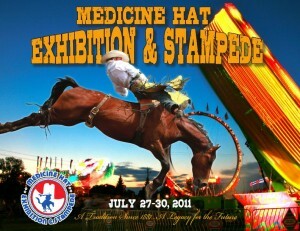 This entry was posted on Friday, July 29th, 2011 at 8:53 AM and is filed under Cypress Centre, Medicine Hat Exhibition & Stampede, News & Announcements, Other Events. You can follow any responses to this entry through the RSS 2.0 feed. You can leave a response, or trackback from your own site.